Noritsu D1005 Compact Printer / DryLab - PFS / Photo Finishers Supplies Inc. 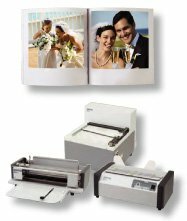 The Noritsu D1005 Duplex Inkjet minilab is a compact, high-capacity, 12” printer engineered to meet the changing photo imaging needs of today’s social expression age. The open architecture used by Noritsu allows easy installation and seamless connections with existing on-site equipment and networks. Just like other printers in Noritsu’s product lineup, the Noritsu D1005 can make high quality single-sided prints. 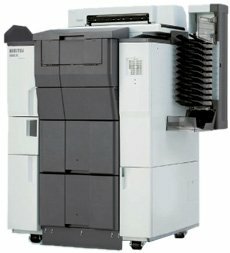 But when you add the Noritsu D1005’s duplex printing ability, this opens the door to a whole new realm of possibilities. 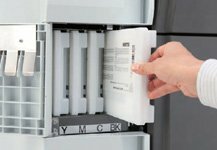 In addition to double-sided 4R prints, this printer can also be used to make photo books with double-sided pages, dual-sided business cards, postcards and greeting cards including commonly seen single-sided photo greeting cards as well as the traditional type of greeting cards that are folded and enclosed in an envelope. This fully automatic system makes it easy to increase your revenue with high quality double-sided value-added prints. All of these products are produced on Noritsu genuine photo paper using Noritsu genuine ink to ensure high quality products with excellent image permanence. To compliment our new dry duplex printer, we will also sell the Noritsu EZ Photo book Binding System (NPB-1), which includes a binder, a creaser and a cutter. The Noritsu D1005 and the above-mentioned binding system “NPB-1” give you everything you need to tap into the lucrative personalized photo product market by making attractive photo books with dual-sided pages. The NPB-1 has the advantages of being compact, efficient, safe, clean, and easy to use. A revolutionary gluing system is used to ensure very little or no waste. 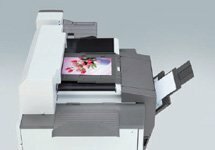 With the 12" maximum paper width and variable paper advance technology, the Noritsu D1005 can make enlargements in sizes of 12x12", 12x18" and many other sizes right up to 12x36". This enables you to offer products such as poster prints, locker prints, and just about any custom print size you can think of. The new Noritsu D1005 uses a 4-color (Yellow, Magenta, Cyan, Black) ink system with 6 gradations per dot to deliver a rich variety of tones and a smooth color portrayal. In addition, it utilizes a new technology that adjusts the size of the dots when they touch the paper. This enables the individual dots to be output in 5 different sizes and allows for a range of 6 gradations per dot, including a no dot (white) variation. The result is high-speed output of high-quality prints with excellent color saturation and fine gradations. The paper absorbs the dye ink, making it possible to utilize the luster of the glossy paper to produce prints of an excellent glossiness. The Noritsu D1005’s prints excel with vivid colors, smooth tones, and a print quality resembling silver halide photos. Prints made with conventional dye ink tend to fade quickly. But the new dye ink of the Noritsu D1005 has an improved molecular structure that withstands exposure to light and ozone. Its prints boast excellent light fastness and long-lasting colors. One of the Noritsu D1005’s biggest advantages is its compact size. 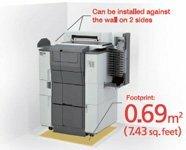 With a footprint of only 0.35 square meters, the Noritsu D1005 is one of the smallest high-capacity retail inkjet printers on the market. Its high capacity of 950 prints per hour (4R) lets you increase output without taking up valuable retail selling space. Advantages like these make the Noritsu D1005 a powerful tool for success. *Calculated according to our criteria. The actual capacity you achieve may vary. The Noritsu D1005 can be installed against the wall in 2 directions and its space-saving design makes it easy to install virtually anywhere! With a footprint of just 7.43 sq. feet you're gaining maximum profit from minimum floor space. There are two print sorter available for the Noritsu D1005, a 4-order print sorter and a 12-order print sorter. The Noritsu D1005 is the first dry minilab in the industry to use LED lights to signify interrupted orders based on order priority. The colored lights signify which tray has the urgent order and which trays have the interrupted order. The dual magazine system in Noritsu D1005 is the first in the industry to support 2-lane magazines, enables you to load up to 4 paper rolls and with the same surface finish or diffrent surfaces. The Noritsu D1005 is the only duplex minilab in the industry to produce prints from both roll and sheet paper. Use the sheet paper facility to produce high quality duplex prints for a range of value-added print possibilities. Maintenance is a breeze with the Noritsu D1005's fast ink cartridge replacement in seconds. The 4 color dye ink system results in less solid waste and less inventory management. There are no photo finishing chemicals involved with dry systems, which means you do not have to worry about maintaining specified temperatures, handling and disposing solution, or other related troublesome tasks. Simple operation with an intuitive user interface. EZ Controller software (sold separately) - The EZ Controller takes care of everything from printing to managing the orders. The graphic user interface is easy to use, even for beginners.This software equips the Noritsu D1005 with the same functions as QSS digital minilabs, handling everything from print order management to color correction of individual images. The EZ Controller simplifies your system’s operation and controls all the devices in your network, such as kiosks, film scanners and CD writers. Paper sizes roll: Width: 3.5", 4” ,5”, 6”, 8”, 10”, 11", 12"
Length of paper roll: 328 ft. Weight: Printer with 4-order print sorter unit :507.1 lbs. Printer with 12-order print sorter unit :529.1 lbs. * Calculated according to our criteria.